"You always want to make your own rink a tough building to play in," Draisaitl said. "We have struggled with that a little bit the seasons before that. We have been really good at home of late and hopefully we can keep that going." "We weren't playing bad hockey, just a couple of mistakes here and there and it's in the back of the net and you're chasing again," captain Claude Giroux said. "The third period we played great again, but we're just chasing every game." 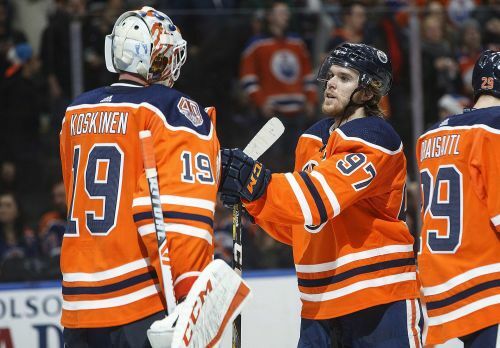 Edmonton got on the board with 7½ minutes remaining in the first period when Draisaitl fed the puck in front to Chiasson, who beat goalie Anthony Stolarz for his career-high 14th goal of the season in his 27th game. Chiasson's previous best came in 2013-14 over 79 games with Dallas. "When you win a Cup, it is a little surprising he didn't have a deal or nothing," McDavid said. "He came in on a PTO and worked hard and earned a job and has been having a great year. I couldn't be happier for him. He is a fun guy to play with. He has a knack for scoring and is finding a way to get open."